ROTC courses are categorized as a Basic Course (Freshman and Sophomore courses) or Advance Course (Junior and Senior courses). Any student may take Basic Course and physical fitness classes without military obligation or prerequisites. Advance Course classes are limited to qualified contracted students (see Commissioning Requirements in the Highlights box). 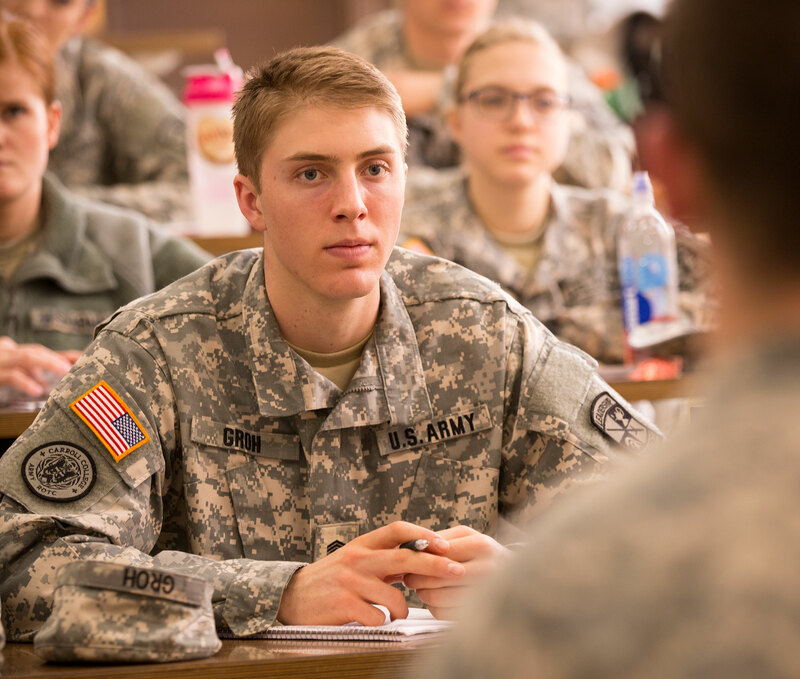 Typically, ROTC students take one three-credit class (2 to 3 hours per week), one workshop/leadership laboratory per week, and one overnight field exercise per semester in addition to their other classes. ROTC students also participate in physical fitness training (5 hours per week). The program provides opportunities to attend confidence-building courses during the summer such as the Air Assault or Airborne Schools, and summer internships, as well as nursing internships. ROTC (Military Science) is neither a major nor a minor. All cadets who seek a commission must graduate with one of Carroll College's recognized majors. Cadets may enroll in a minor program if they choose, as well as take other elective classes. In addition to classes, cadets participate in one weekend Field Training Exercise, or FTX, each semester. During this FTX, cadets will practice squad tactics, land navigation, and other important cadet training in a forested area. Other students enrolled in Military Science may participate in the FTX if they chose. The FTXs are completed with our Army ROTC host school at the University of Montana Grizzly Battalion. Our goal is to produce ROTC graduates who are leaders, thinkers, and decision-makers. They meet problems head-on and solve them quickly. They know how to adapt to rapidly changing situations and to take charge, traits sought after in a military career and by civilian employers. The ROTC program at Carroll had seven graduating seniors in 2016. Five of those now Second Lieutendants have taken their oaths of appointment on May 13 and have become Commissioned Officers in the United States Army. Those newly Commissioned Officers include: Michael Gannon, Lauren Snodgrass, Alaina Clarke, Cody Noffsinger, Alyssa Kresge, Rachel Schorr, and Emily Olson.